Found throughout the eastern and coastal regions of Australia, koalas survive on a diet of eucalyptus leaves. With strong limbs, sharp claws and opposable thumbs, koalas are well adapted to climbing. These marsupials are nocturnal, and spend most of the day sleeping in the crooks of trees. 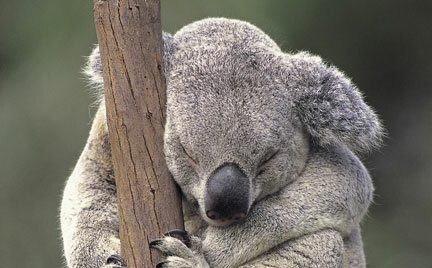 During the night, koalas climb high into the trees to eat several pounds of eucalyptus leaves. Dependent on their eucalyptus trees, koalas are highly susceptible to habitat loss.